Want to see what Mosman looked like 100 years ago? Historical subdivision plans for lower north shore now online. Have you ever wondered what the lower north shore looked like a century ago? The State Library has released 40,000 subdivision maps, providing a valuable insight into the lives of New South Wales residents from 1860 to the 1930s, illustrating the spread of suburbs across Sydney and regional areas. 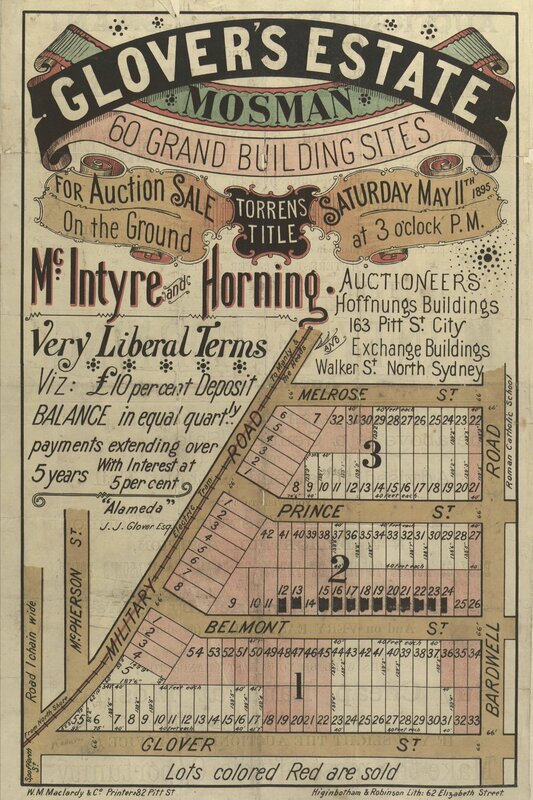 Hundreds of Mosman, Cremorne and Neutral Bay maps can be found in the archive, detailing the rush for families to purchase land, away from the confines of the city. Lower north shore posters were pitched to aspirational buyers, who could “have a great advantage over their friends settled at Petersham, Ashfield, Croydon, Burwood, Strathfield, Manly, Drummoyne and other suburbs”. From the 1890s to 1914, subdivisions flourished along the local tram route, with Mosman land sales and home building gaining momentum. In 1909, Richardson and Wrench’s poster for ‘Mosman Heights’, comprising 60 lots overlooking Pearl Bay, was promoted as a location “unequalled for a residence, with its cool climate, salubrious air and magnificent views”. “You are away from, and yet near to, the great hot and dusty city,” the January 1909 advertisement reads. “And the time from leaving the Quay to the Estate, including boat and tram, is only 35 minutes. During this period of rapid growth, at least 513 parcels of local land were re-created into “grand” and “supreme” estates, with names like “Kookaburra” (1902), “The Tanja” (1914), “Cuba” (1921), “Toorak” (1931) and “Bonnie View” (1924). The historic collection offers a unique insight into Mosman and its neighbouring suburbs, showing how prices, spelling and even street names have changed over time. One Clifton Gardens subdivision, sold by David Thompson in 1912, advertises large lots in Mary St (now Kardinia Rd), Margaret St (now Iluka Rd) and Sarah St (now Morella Rd). In 1918, Sirius Beach Estate was released by property agent Arthur Rickard, even offering a “shark proof barrier across the head of the Cove”. “The barrier has thus created a Sea Park and an absolutely safe bathing area,” the brochure reads. “For the convenience and pleasure of the thousands of children who will resort to this playground, they have also erected Splash Boats, Swings and See-Saws. “Dressing sheds for Ladies and Gentlemen have been erected by Mosman Council,” it finishes. The collection of maps and advertising posters can be viewed online at the State Library of NSW. Walkley Award winning journalist and acclaimed historian Gavin Souter shares his memories of seven decades in Mosman. Exclusive: Jamie Oliver and Nigella Lawson dine at Bathers Pavilion on Balmoral Beach, so what did they order?